The Miss Hong Kong 2014 pageant finals concluded on August 31. Contestant #15, Veronica Shiu (邵珮詩), won the crown with 156,191 votes, as well as the Miss Photogenic and Miss Friendship awards. Contestant #9 Erin Wong (王卓淇) was named first runner-up with 28,894 votes, and #7 Katherine Ho (何艷娟) was the second runner-up with 24,903 votes. The winners were selected based on a combination of votes from viewers as well as celebrity judges. When the top three finalists were announced, the results stunned viewers and the show’s hosts. MCs Eric Tsang (曾志偉) and Carol Cheng (鄭裕玲) acted shocked on stage. Hot favorites, #3 Linna Huynh (黃碧蓮) and #11 Sofiee Ng (吳凱欣), were speculated to have high chances of being placed. The reports claim that you are engaged!” while Jan avoided to respond directly. During the interview rounds, contestant #5 CK Leung (梁詩其) was asked whom she would introduce to bachelorettes Carol Cheng and Charmaine Sheh (佘詩曼). CK said, “I’ll introduce a well-bred man for Carol because she is very cultured. Beautiful ladies match with handsome men, so I’ll match Charmaine Sheh with Bosco Wong (黃宗澤).” While CK’s remarks attempted to flatter Charmaine and Bosco, who were celebrity judges at the pageant finals, the stars appeared to be embarrassed to be put on the spot. Veronica is ugly as hell. So disappointed that she won. She has big gums and ugly teeth. I watched both before selection and the pageant. I like #3 and 11, but they did not make it. I don’t understand how veronica is pretty. I was kinda shock that she won Miss Photogenic.. I thought #3 Linna looks prettier than her, and even #11 Sofiee. I thought Veronica looks average. #15 Veronica has some sweet looks at best but nowhere as pretty as #11Sofie and #3Linna. Veronica’s teeth need work! #9 Erin and #7 Katherine are pork chops! How can these three represent HK in international beauty pageants when they look like this? Agree I don’t watch but how can #15 win most of the awards and Most Photogenic? #11 is the prettiest and #3 is the cutest! Where are they? I’m sure TVB and Sandy Yu rigged the results! If you look at https://www.facebook.com/veronica.shiupuisie?fref=ts, she has 933 people who most likely voted. Now add that to her family members, her classmates, Fairchild TV employees, tvb artistes who came from Vancouver including Gloria Tang, her votes would exceed the other two. i totally agree. clearly 8 out of the 15 judges need to get their eyes checked. Everyone is shock! photogenic should be #3.
top 3 should be #3, #11, #15. How #7 and #9 got in? I tell you this is TVB. Wtf TVB must be rigging this! #11, #3 and #12 are lot more prettier than these ugly chicks on top 3! Lucky I’m not watching this! #15 is quite sweet looking but nowehere pretty! #9 and #7 are downright ugly pork chops among the contestants how can they beat the pretty #11 and #3?? Pork chop #9 Erin will be representing HK at Miss World! Total fail! HK would look better if Linna won the runner up. This is totally staged TVB don’t want Sofie and Linna to win when they are the hot audience favourites! Well… you never know. .. Sorry to burst your bubble Toby but Grace Chan (last year’s winner) is representing Hong Kong. See https://www.facebook.com/MissWorldHongKongChina/. The photo of Grace Chan is also on Miss World’s contestants page. 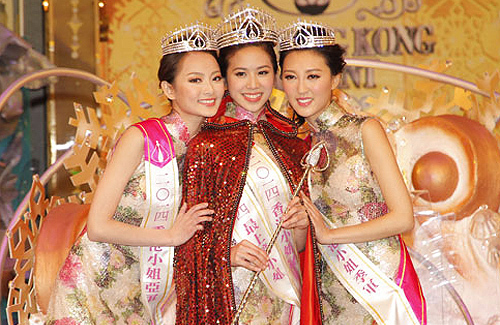 #15 – Veronica, Typical Miss Hong Kong winner. I am not surprised there. She looks comfortable, friendly and sweet. Yes she doesn’t stand out like Grace or have stage presence, but over the years Miss Hong Kong was never the Leng Mo pretty types. They are usually the classic beauties usually on the chubbier side (except for Grace bc she is really just stunning). I am not sure, there is something very wrong with her face which made me feel like I am watching Miss Asia instead of something grand like Miss Hong Kong. I mean it was serious improvements last year 2013 and maybe 2012. Everyone looked like Miss Hong Kong. Is it because she is very northern china looking or her mouth is slanted when she speaks. Though I will give it to her that I think she does speak well. Overall- I want to ask TVB whether it is political reasons that they chose #9 and # 7 so that these two girls with mainland china background can ease the situation between China and Hong Kong? Or did they want to slowly encourage more mainland china contestants who has HKID to join Miss Hong Kong. Miss Hong Kong is no longer that great, qualities dropped over the years….. these girls could easily join pageants in China and have better outcomes in the entertainment industry. Why bother come and compete with girls that are from Hong Kong? I agree, especially with #9…the judges should’ve really tried to get to know these contestants better than just basing off of the final night or unless the top 3 were chosen beforehand. I saw the VIP interview too and she seemed pretty rude when she kept interrupting #7’s turn. I actually thought that it was based on viewer’s votes but TVB chose the Top 3 and just let the viewer’s pick among them lol wow I felt cheated after watching it. I pity #11 and #3 for not making it at all :/ although #11 didn’t exactly have the best answers but if you compare with her question to other contestants, hers was definitely harder. But really.. it is a “beauty” pageant afterall right.. I would have had the top 3 as 15, 11, and 3. I think like CC said the top 3 has political influence and staged by TVB. Why else would TVB shun out the audience favourite Sofiee and Linna. this pageant was run differently from other pageants, usually they would eliminate the traditional way but this time they only extracted 3 contestants from the rest and based the rankings out of the 3 selected. Now, we don’t even know who is technically “4th”. I agree that #11 had it really difficult and #15 was heavily favored/promoted throughout the entire show which is unfair. Also, #15 had it easy for most of the show, I understand Joey Yung likes her and endorsed her throughout the show but i really don’t see her as the most fitting candidate for the most photogenic award, let alone the miss hk 2014 title. If I were to have my picks it would be #11, #7, #9. I do not understand why it happened the way it did. I do not find #15 particularly special in anyway. Smarts; i would say #7 is the smartest. Beauty has to be #11 which is the prettiest. This makes no sense…but its TVB and they don’t always produce the best miss hk talents. We shall see how Veronica succeeds in the entertainment industry where i can only see her as average at best. Well, i not sure as i did not watched the whole show. But since this year the girls are pretty much quite overall on their beauty. Its all about perception as we cant judge who is prettier than who. Its about luck as well. If the judgers and the voters like her, then she is the winner. Just finished watching the show. How #9 got placed in top 3, and then went on to win 2nd spot, I just don’t understand!!!??? Right from the beginning, she gave me the impression of someone very fake, superficial, always wanting to steal the spotlight. So funny how every time they put the camera on her they talk about her special talent of being able to tell the difference between a male squirrel versus a female one. LMAO. Really, that’s talent? Her talent was the fact that she was able to balance her oversized head on her unhealthy, unproportioned, washboard figure! TVB always sends runner up to Miss World. I can’t imagine this skinny pork chop face #9 representing HK among other international beauties! Omg my eyes! She will be eliminated on first round! #9 also cause controversies because she’s not born in HK but still allowed to enter MHK just because she has ID card. She’s from Guangzhao! There’s a lot of favoritism going on from the start. Her mom and her are famous in HK media as gold diggers. Hey Toby, does #9 come from family with connections? If so, that would explain her placing in 2nd. i don’t see why it matters that she was born in Guangzhou. Angelababy and GEM were both born in the PRC but most people take them for hongkongers including hongkongers themselves. What’s with all the fuss?.? #11 did not win simply because she did terrible in all her Q & A. And it’s not like she had a great figure either. Accept the reality, people! Was wondering about #11. Watched it yesterday and can’t help but laugh. You said it all. #11 & #12 answers were pretty close. However, #12 turns the table on the judge and that’s funny. 😀 🙁 LOL! BTW, I do not pick a favorite from the start. This is what I saw after watching the show. First of all, disclaimer – I live in Vancouver and happen to know #15 in person (actually, her family) – BEFORE all this craze. She, in real life, is EXACTLY that: “cool, calm, poised”, and I would like to add: sweet, friendly and polite. I’m a good 15-20 years older than her (and i’m an upstanding well educated member of society, who rely heavily on a BS-radar in my line of work), yet when I interacted with her, I was impressed with her manners and her genuineness (is that a word? LOL) – she feels REAL. Calm and collected, and appears genuinely interested in conversing with you even when you may not be someone who’s gonna help her get “ahead”. I don’t know any of the other contestants but we should all remember this: beauty is both outside and inside. Veronica at least has the INSIDE part down. I think she has well-balanced facial features (and figure) to represent HK well in a worldwide competition. No losing face there. What more could we ask for? it’s not like we got such good luck every year! Besides, international (“gwei lo” 🙂 beauty judging panel have standards that sometimes seem weird to us Chinese…. there’s no saying how far Veronica might go in Miss Universe. Remember Pauline Yeung in the 80s, who placed 5th in Miss Universe (to the shock of most of HK)? First of all, TVB doesn’t send representatives to Miss Universe anymore. Sonija was the last Hong Kong representative at the pageant in 2000. Veronica will most likely go to Miss Chinese International only and we all know how well HK does at that pageant (since it’s also hosted by TVB)….. I see 2nd RU for her so far. I see her inner beauty but facially, she is not one of the best in recent years. Her mouth is a little top big and her nose is a little distracting. Her voice is good though. I don’t see her being very popular in the upcoming years though. Erin goes to Miss World, Katherine to Miss International. Both will be standing on stage to act as backdrops and clapping all night. Btw, I wasn’t born in the 80s but I did hear Hong Kong was shocked by how well Pauline did at Miss World and Miss International. Does anybody have any news articles online to share about HK’s reaction? Her 1st RU – Elizabeth Lee is stunning too but I don’t know if she would’ve done as well as Pauline did. Even Michelle Reis was a fraction of a point away from making top 10 at Miss World and she is considered to be the most stunning Miss HK LOL. Sorry to burst your bubble, Andrew. But Grace Chan is HK’s representative this year. Usually they have their pageant during summer time but that got postponed. See https://www.facebook.com/MissWorldHongKongChina. Grace Chan’s photo is on that page as well as she’s on Miss world contestant page. LMAO, reply to me when the pageant starts in December. The girls always change. Last year, Grace was rumored to compete but Jacqueline Wong ended up competing. As much as I want the bubble to burst, until she arrives in London, nothing is confirmed at this moment. No, Jacqueline Wong replaced Carat Cheung because Carat was overaged. Grace Chan is this year’s representative for Miss HK. Read my post above Fiona. Representatives being replaced happen all the time. Like I said before, I do wish Grace gets to compete because she has such a beautiful face but since it’s held in December and her reign has ended, I wouldn’t be surprised if the reigning queens compete at Miss World. If tvb was biased towards Vancouver girls, don’t you think that the results of this year’s pageant could have been similar to 2012 where all 3 contestants are from Vancouver? There were another contestant that also came from Vancouver and participated in MCVP but she won nothing in this pageant. #7 was too young, lacking in figure, looks. Not “dai tai”. The one thing she had going for her was Q & A. She was quite articulate. I can see her hosting for TVB in the near future. She was probably in TVB’s plan right from the beginning. Really surprised No.15 won the title… She was simply someone who had little advantage for being Miss Chinese Vancouver 1st runner up in year 2012. Watch the aftermath interview, maybe it will change your mind. 😀 🙁 LOL! #3 is cute but she can’t speak the language very well. Tvb wants someone that can make money fast for them. She’s lucky to make it to the finalist. #12 caught my attention with her Q&A. She’s a smart girl. But overall it’s the total package that won. 😀 🙁 LOL! I dont understand why people think #11 should win. She is not that pretty. Also based on her Q&A, she does not look smart. I prefer #5 CK Leung, prettier and more elegant. Might get fried again for this. Just stubborn for all the wrong reason. 😀 🙁 LOL! I also find it odd because the majority of judges also favoured #3 and #11. Not sure how TVB will benefit from rigging the pageant though. Looks wise I agree with the majority that the winners are not the prettiest. If results are based on how well they answer questions then why not just select someone from a verbal or written exam…? U are very right. no need to look pretty to enter miss HK from now on! Very shocking to see these three!!!! this year is not about the look at all. god knows what!!! What on earth is #13 Crystal doing in the finals????!! Watched the semi finals and I am shock she is in finals. #14 Fiona Fong should be in the finals instead. Agree with you, #13 (Crystal is that her name?) should not have been a finalist at all. Heck, she shouldn’t even have qualified for semi-finals! She sounded and looked like the typical airhead you pull from the streets. Girls that try to talk cute with voices like that annoy me to the bone. #13 DID REALLY BAD IN HER Q&A. I felt embraced for her. Afterwards I saw on TV Dodo and joey yeung we’re making fun of her for it. That was so mean of them….. ??? You mean in the radio?? When are they hosting a tv show together? I think #15 is quite a deserving winner. She had the most well rounded performance out of them all in my opinion- the looks, sweetness and decent responses. I think there is a genuine quality about her that is also captivating- she doesn’t seem fake and contrived like some of the other contestants. I think that is what drew her to most people- evidenced by the fact that she also won miss friendship. For example, #5 is quite pretty, and as a model had the best poses overall, but because of that, it all seemed too rehearsed and snobbish. If it was just based on looks alone, I probably would have picked #11. I’m not surprised #11 and #12 didn’t place because they faltered badly during the Q&A and showed no signs of eloquence or intelligence. #3 performed well and is also quite cute, I’m a little surprised she didn’t get top #3 maybe because of her fluency in Cantonese. #7 was the best in terms of her quick wit and articulate intelligent responses, this might be due to the fact that she’s a law student and likely has the gift of gab. Her overall performance in terms of look, and poses etc. were pretty awful since she seems so stiff, but I acknowledge that she performed the best in terms of her responses to the Q&A. I would have given her top 3. #9, I wasn’t a huge fan of though I acknowledge she performed adequately- in my opinion she was just picked for political reasons. Finally, to poster “Heidi” I’ve briefly glanced over your posts and can’t help but feel sorry for you that you’re an insecure troll. You are quick to criticize and respond abrasives to others comments. Your comebacks seem to revolve around yourself being pretty and others being ugly- this is completely irrelevant as no one is judging your looks. In fact, it’s the personality you’ve portrayed that is ugly. Your second comeback is that your English grammar and composition is superior to others. This is evidently false as there are multiple instances where you comment using poor grammar, punctuation and incoherent sentence structure. Everyone is entitled to their own opinion about the contestants even if it is a complaint or critique about a specific contestant. It is a beauty pageant after all, the contestants signed up to be judged! I know that you’ll likely troll and fire back obsessively with multiple comments, but I find your behavior and attacks on other posters utterly repulsive. i just finished watching the show. I agree with your observation. #9 did answer that Q&A quite well. #11 was only pretty but didn’t give good answers in any part. #15 veronica was well rounded. she’s cute, gave decent answers and danced well. oh and #7 answers are really witty too!! I thought #9 was a little overconfident. Her answers were decent. It’s not like I’m the only one who’s making attack on others, a lot are doing doing too. Why only single me out? You’re such online bully. At least I have the class not to call the contestants ugly or porkchops. Look at what other posters calling the contestants lol. If you’re talking about ugly personalities, I have seen a lot worse than me. At least I have the decency to call people names. Nope I didnt. I just said she not pretty. Looks like someone new jumped on the haters bandwagon without knowing the full story. I’m glad that #3 didn’t make top three just to see those who supports her get really pissed about it. Lol… life is so unfair isn’t it? Lol…. Did someone here changed their screen name to continue bashing me? heidi is clearly jealous. jesus christ . u actually are on here 24/7. u poor poor child… you must be one of those people who have such low self esteem that they gave to make others feel bad or piss ppl off to feel slightly better about themselves. i feel more sorry for a pathetic human being like u than 3 and 11. cuz unlike them, they were being judged and when stuff gets rigged, then its too bad for them. but you have the option of changing for the better but u choose to stay an ugly troll to bash and try toput down those better than u. but its ok. they will always have support of family and friends and online fans. but u, good luck. u can go hold up your own banner. My goal with my comments is to pissed you haters. Not to actually bash #3. I have no reasons to be jealous or hate her cuz I don’t her. Mission accomplished!!!! That was a fun game to played. Bye, bye!!! LOL, I rest my case really. Heidi is just a batsh!t crazy troll. My time is more important than to spend 4 hours of my time in a slew of desperate posts bashing other posters and contestants. I’ve derived so much amusement from her- is this really what the next generation holds? Sad really. Happens all the time lol. Kayi Cheung and Carat Cheung were also former pageant girls of the Vancouver pageant. Is it because they think Miss HK is easier? Maybe because they went to enter TVB?? If they don’t successful compete at Miss Chinese International, they can take the HK route to get there LMAO. Kayi, Aimee, Carat, and now Veronica are all recycled contestants from regional MCI pageants. I understand why the judges like #15 but beauty wise, I prefer #3 or #11. Like some users pointed out here, Hong Kong will NOT go far or place at international pageants like Miss World or Miss International. The only saving grace is if TVB sends Grace Chan to Miss International or Miss World 2014 but I doubt they will… All they care about now is finding the future “fadan” rather than the next Pauline Yeung or Rowena Lam (girls which performed well at international pageants). Soifee looks more pretty. Her teeth are not as distracting. There are press releases from the main organization that Grace Chan is HK’s representative. And like others have said no, this competition was POSTPONED. Usually, it is in December. during the summer months, i mean. Lol Fiona, don’t believe in everything MW org. Says until the last minute. Kelly Cheung represented HK at the pageant in 2012 when she didn’t even compete in Miss HK lol. Seems like you need to research more. Lol, Fiona, for your information, I watched Miss World since 2005. I follow almost all pageants so I can say I am more familiar with the system that you are. In anyhow, my point is, basically TVB is not consistent with sending their representatives to the pageant. They usually send 1st, 2nd, and 3rd place winners to Miss Universe, World, and International respectively. Ever since 2001, the format changed and the winner competes in Miss Chinese International only. The 1st RU and 2nd RU still go to World and International. In 2005, it was rumored that the winner goes to World now and 1st RU to international. But, Carrie Lam didn’t compete in Miss International. Janet went to World instead of Aimee. Then in 2007, Kayi went to World instead of Grace but in 2008, the 1st RU competed in World again LOL! Then in 2009, they switched the format again and the winner competed in World. But in 2010, the format switched again (Sammi Cheung went to World). Last but now least, the 1st RU went to 2011’s Miss World pageant INSTEAD OF REBECCA ZHU. See the inconsistency my dear? Of course there are exceptions, which you pointed out. Date changes and overage issues are some reasons why other girls get sent. But, my point is TVB is not consistent with sending their girls to the pageants every year. For 2012, TVB COULD’VE sent Rebecca Zhu or Whitney Hui to Miss World. At least they competed in Miss Hong Kong lol. Until Grace arrives in London on December, don’t believe it’s 100% confirmed that she’ll be competing. As far as I know, she’ll be filming in China during the winter so she may not have time to compete. As much as I want her to go… Tvb makes changes at last minute LMAO. FYI – there was press releases that Grace and Sisley will compete in last year’s miss world and miss international pageants. What happened in the end? Despite being crowned before the 2013 pageants were held, Moon was sent to compete in Miss International. As for Miss World, it was held in September 28, way after Miss Hong Kong was crowned on August 31st. Despite so, Grace nor Sisley was sent to Miss World. Earlier press releases indicated Grace will compete FYI. Allow me to be a little rude and say this – please do a little research before commenting. Grace Chan is GOING to MISS WORLD. Usually, miss world is during the summer, but this year, they postponed it. By the way, I read a post that TVB is addicted to Vancouver girls. That is so true!!! Vancouver has won a jaw dropping 6 times at MCI, some which are deserved, some which are not (I.e. 2002, 2005, 2012) and their girls do well at Miss HK. Virginia (1997), Anne (1998), Sonija (1999), Vivian (2000), Kayi (2007), Carat (2012), Grace (2013), and now her all come from Vancouver. I honestly don’t get the hype over girls from Vancouver. Seems like they win because the quality of the local HK girls are not as good. I understand 1997, 1999, and 2013’s wins but not so much the other years. I guessed it’s because they faced slightly weaker competition those years. And that original poster left out 2012. All the girls that year are from Vancouver. It’s still a head scratcher how Roxanne failed to make the top 3 that year. Some of them were born in HK but had their education here in Vancouver. My point is TVB looks towards Vancouver for crowning their winners and promoting future fadans. There is bias towards Vancouver girls. Exactly. Jamie lee (contestant #8) was eliminated and she came from Vancouver as well. If tvb favoured Vancuver girls, then Jamie would have been in top ten and then eliminated. But nope, was eliminated. If TVB was looking to promote female artistes or to promote future fadans or to promote Vancouver girls, why did none of the Canadian representatives placed in the 2012 MCI even when one of the contestants was related to Michelle Yim? Lol, you have to be joking me. Veronica bagged every award in the pageant, with the exception of tourism ambassador and she is from Vancouver. And yet no bias there lol? As for Jaime not making it, I’m not surprised because facially she is one of the weaker ones this year. She competed 2 times to enter Miss HK but failed so that is on indication she may be lacking something. In anyhow, there is no denying TVB has crowned MANY Vancouver girls in recent years. I don’t want to list them all out again, scroll up to see the enormous number of Vancouver winners at Miss HK and MCI. You are looking at one particular year there. The Vancouver reps that year didn’t look too stunning. You can rewatch the pageant to see for yourself. KL and NY were the real stunners that year. I wasn’t surprised both reps. didn’t make the top 10 because their competitors were strong too. Guys, you really need to do some research and you will see how biased or say it another way – TVB favors Vancouver girls. Two out of the top 10 are from Vancouver. Forgot the number last year but Grace won (rightfully and deserving though). 2012 featured AN ALL Vancouver top 3 AND one of the other top 10 girls came from Vancouver. 2011 also featured girls from Vancouver (like #1 and maybe a few others but I forgot). 2010 had another 2 former miss Chinese Vancouver competitors and maybe another few have Vancouver backgrounds. 2008 and 2007’s 2nd RU come from Vancouver too. My point is – if you think TVB does not pay special attention and favor girls from Vancouver more, you are wrong. Many girls from Vancouver get selected to compete in Miss HK every year. May not be the best but it’s enough. And may have gone on to win the crown. That is a jaw-whopping FOURTEEN crowns Vancouver has won. I didn’t even count the runner up crowns they have won at both pageants. And you say no bias or favoring lol? The winner from 2012 Miss Chinese International did not come from Vancouver. She came from Chicago. 2001 (Bernice Liu), 2002 (Shirley yeung), 2004 (linda Chung), 2005 (Leanne Li), 2010 (eliza sam), 2013 (Gloria Tang). You have certainly misread my post. I said the 2012 winners of Miss HK are all from Vancouver. I did not say Vancouver won MCI 2012. Btw, do you know Fairchild LOVES to boast how beautiful Vancouver girls are? Every time a URL from Vancouver wins MSHK or MCI, they will drag Vancouver into it. 2012 Miss HK was one of them. make me wonder if this is andrew yu.